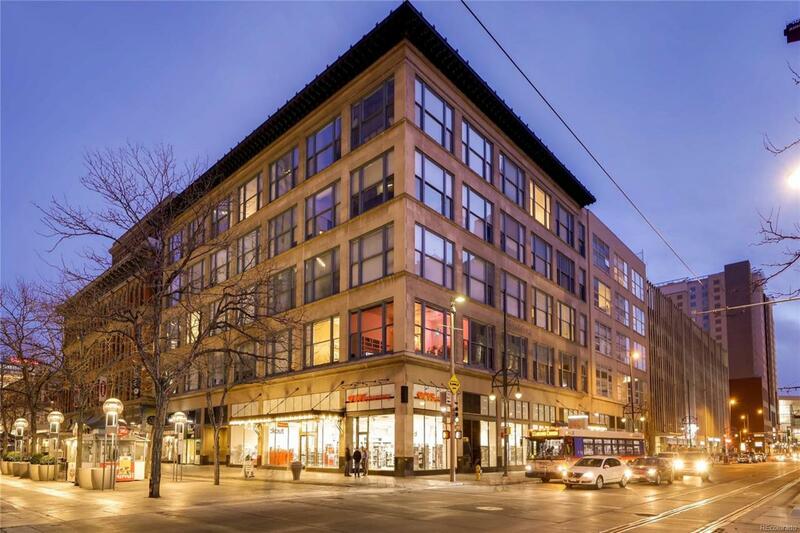 Located ON the 16th Street Mall, this open and bright 1-bed/1-bath loft condo in the Penthouse level of the historic Neusteter's Building could be your perfect first home; a downtown retreat or a great place for a downsize. At 740 SF with 17+ foot ceilings (tall enough to build a second floor loft office or bedroom) the home is large. The living room features a wall of west-facing windows with spectacular city views. The euro kitchen is framed by a unique architectural arch. The large bedroom will accommodate a king-size bed plus extra furnishings. A large, walk-in closet and a separate coat closet is in the entryway will hold all you cloths. A covered and secured parking space and storage locker are in the basement. The community also has a fully equipped fitness center, a billiards/game room and dedicated laundry on each floor.The property is ideal located for downtown living. The mall ride bus transports you to hundreds of restaurants, bars, performing arts and sports venues. Association Name Primary Neusteters Building Condominium Association Inc.